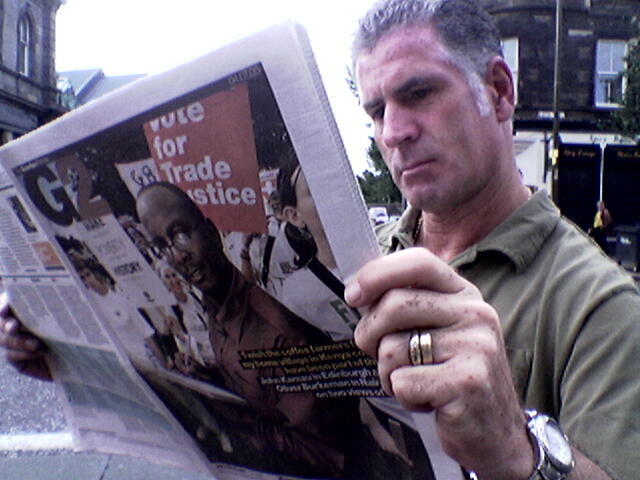 I am still holed in Edinburgh hoping to get a glimpse of the G8 leaders if I am accredited. Today was my day and had a big story in the Guardian newspaper complete with a big photo on the front page of their pull-out. (Should I claim celebrity status? No. I am still the humble Kenyan from a village in Muranga district. Meadow park rally represented all that I stand for: justice. But Edinburgh today also hosted some anarchists who have made me stay in doors because they had threatened violence. I went to have a glimpse of what they were up to but decided to get out of George Street because they had started to break away from police line. Yesterday we had a chance to see the Yes Men, two activists who dupe journalists and masquerade as CEOs of companies. They have once duped BBC which had a breaking news on their announcement on Bhopal Gas victims.